The Federation is generally peaceful and so we see numerous instances where they are easily imperilled by relatively small aggressors with fairly minor power differentials, such as the Dominion, periodically the Romulans or Klingons. numbers will vary according to source of information). Warfare with large scale opponents like the Dominion invariably involved direct support (coalition operations) from the Klingon and Romulan Empires, two other major regional (and separate) powers. They also had significant support from the Bajoran insurgency and "supra-normal" powers (the wormhole entities). The Federation could not have tackled the Dominion by itself. The Alliance was able to build and maintain a galaxy-wide insurgency, while the Federation is confined to fewer systems more or less in one quadrant. The Rebels were major underdogs against an Empire that spanned from the Core to the Outer Rim, but would be fighting on much more even terms against the Federation. One of the biggest assets of the Rebels in the fight against the Empire was their righteous cause which allowed them to undermine the Empire's popular support. This would not work against the Federation as it is different in character than the Empire. Starfleet makes up for its low crew numbers with significant amounts of miniaturization and automation. Where the rebel alliance has squads of gunners, Starfleet vessels have a tactical officer and computers. Starfleet does more, with less. While it is true that the Imperial navy is larger than Starfleet, it is also more spread out (it covers a whole 100,000-125,000 light year galaxy). The Federation is only spread out over 8,000-10,000 light years. 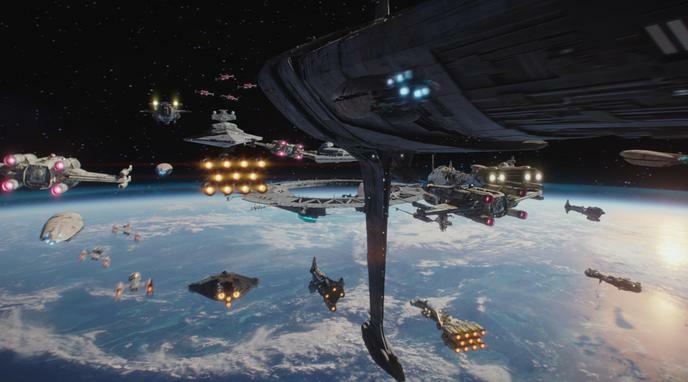 As such the relative concentration and density of Starfleet vessels is greater, which could mean the Rebels would be outnumbered and overwhelmed in any skirmish or battle. They also would not have the ability to infiltrate the UFP the way they were with the Empire. As members of the empire, the rebel alliance could have spies in several key spots. They do not have this advantage with the UFP, which is in a different section of space. This would also take away many of the guerrilla warfare tactics used by the rebel alliance. Rebel fleet, though the 'Battle of Endor' represented a vast majority of their ships and power. Generous estimates would put this around 1500 at maximum, including fighters. The Federation on the other hand has commissioned over 75,000 vessels (though that is over the course of its lifetime). At the height of the 'Dominion War' it could field between 10,000-15,000 vessels. dwarf the number of ships of ships deployed in Endor, many times over. bigger than it, and is more used to war than the Empire was, the Galaxy Far Far Away having no major wars between the Clone War and Rebellion, and few fleet battles in the latter.